Posted in: A Walking Tour of Old Ravenswood. Tagged: +41.968998 ° Latitude, -87.67436 ° Longitude, 4250 N Hermitage Ave., 4800 N Ravenswood Ave., Algonkian, Algonquin, Battle of Bad Axe, Cahokia, Chicago, coureurs de boid, Development, Father Louis Hennepin OFM, Fort Dearborn, Fort Dearborn Massacre, French, French Missionaries, Illiniwek, Illinois Territory, Iroquois, Jean Nicolet, Kaskasia, La Nouvelle-France, Mciigamea, Miami, Moingwena, Native Americans, Neshnabek, North American exploration, Peoria, Pouutouatami, Railroad, Ravenswood Metra Station, Red Bank, Rene Robert Cavelier de LaSalle, Robert Cavelier de La Salle, Suburban, Tamaroa, Treaty of Chicago 1833, Upper Louisiana, Urban, walking tours. The State of Illinois is an outgrowth of the history of many peoples. Many of their influences have vanished, sealed beneath the foundation of homes and the construction of roads. Here, in Ravenswood, Native Americans lived for thousands of years prior to the first European explorers. Pause a moment here, on the train platform and have a look around. In your mind’s eye, can you remove the buildings and roads to imagine what this place was like 500 years ago? This area lies about a mile from Lake Michigan and about a mile from the Chicago River. Prior to European settlement the area was a mix of marsh and low sandy ridges, one of which formed the Green Bay Trail. Today we call the Green Bay Trail by a different name: Clark Street. Mound people, called Mississippians, probably established a settlement about six miles from here in Chicago near Wolf Point. The collapse of the Mississippian culture coincided with the ravages due to the introduction of Euro-Asian diseases, the beginning of the Little Ice Age and the introduction of horses to North America. 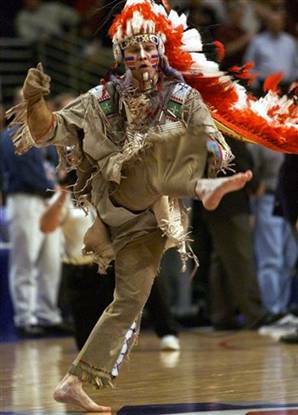 Chief Illiniwek, a modern interpretation of the tribe that once lived in the Chicago area, was once the mascot of the University of Illinois. The school was criticized for what many people, including Native Americans, considered a racist depiction of the Illiniwek tribe. Their tribe spoke a language shared by many other tribes, Algonkian. Those tribes included the Cahokia, the Kaskaskia, the Michigamea, Moingwena, Peoria, Miami and Tamaroa. Despite their shared language, the Miami were considered a separate tribe from the Algonquin confederacy. The population of the Illiniwek were estimated to be about 6,500 by Father Louis Hennepin, OFM, a French missionary about the year 1680. de La Salle, in 1684, states about 1,200 Illinois warriors gathered at Fort St. Louis in that year. The Illiniwek and the other tribes encountered by the French, were not settled people. Some of the older members of the tribe, along with slaves, would plant fields of maize, gourds and pumpkins. These fields would be left for growing as the tribe engaged in hunting elsewhere. Winter quarters may have consisted of long arbors covered with mats of reeds. The Illinois Confederation of tribes could not resist the Iroquois invasion of the Midwest. Many of the tribes crossed the Mississippi River to settle in Kansas, Missouri and other western states. In the years that followed the area around the mouth of the Chicago River changed hands several times. The Miami, the Potawatomi, a French garrison, the Potawatomi and the Chippewa, the French again and finally the British, who took control of the area in 1763. The Potawatomi remained a force in the area, allying against the US and with the British, even after the Treaty of Paris gave the US sovereignty of the area. In 1812 a Potawatomi band ambushed the garrison of Fort Dearborn as it attempted to march to Fort Wayne. The US rebuilt the destroyed Fort Dearborn in 1816. You can see its outline today at the corner of East Wacker Drive and North Michigan Ave. The US defeat at Fort Dearborn had unfortunate long-run consequences for Native tribes. Remembering the ‘massacre’, European settlers demanded the removal of all native tribes from the new state of Illinois. A treaty signed in Chicago in 1835 (the Chicago Treaty of 1833) caused the evacuation of the Potawatomi from Illinois. According to Ron Grossman, writing for the Chicago Tribune, 500 warriors gathered in Chicago to conclude the treaty, dancing in full dress and brandishing tomahawks.